Once a "New strategy" is selected, the system creates a new strategy file in "~\AppData\Local\JForex\Strategies" directory. 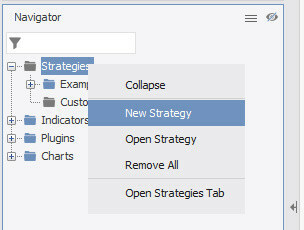 The Strategy by itself is a java file, which can be edited in any Java compatible editor. Compilation results can be viewed in the "Messages" tab. A "Compiling... OK" message is displayed, if compilation was successful. Otherwise, you get detailed error messages. 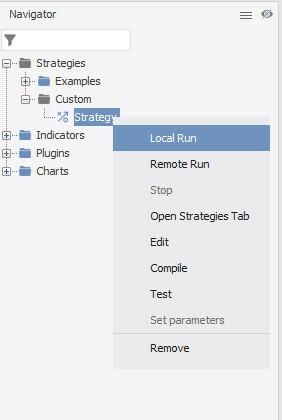 Once the strategy is compiled, one can run it by left-clicking on it in the Navigator pane and selecting Local run.